Make your own background. All embellishments, paper and card stock is from my stash so I do not have all the names of the companies. Today's post is for Simon Says and OWH Our Daily Bread Designs make your own background challenges. I used a A2 card base to start with. 1. I started with Stampin' Up Red ink and white card stock. Stamped out a brick like background. This was easier than I expected since I had no background stamps. 2. Then I adhered with TomBow permanent adhesive the background onto the card base. 3. 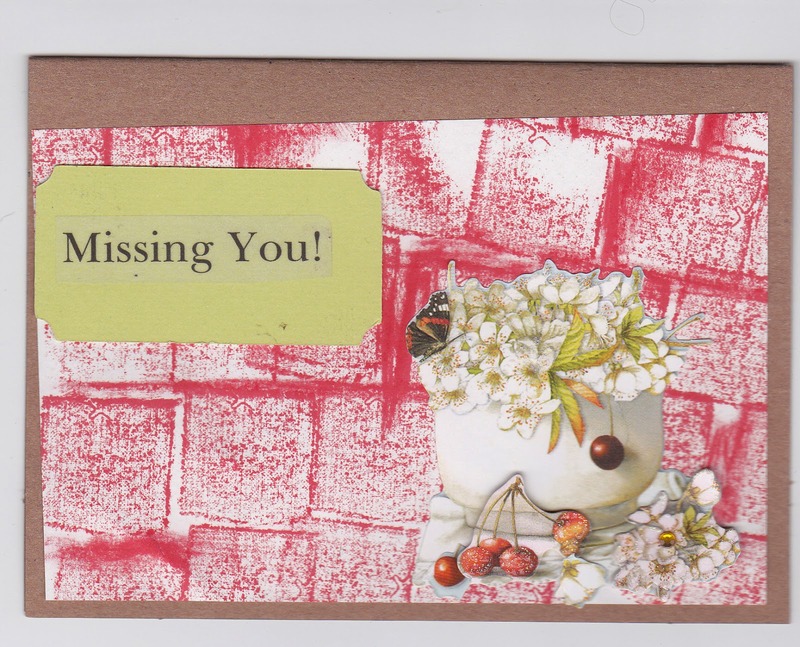 Added the green tag and "Missing You" with TomBow. Last added the basket of cherries. GREAT job on using a small stamp to create this lovely brick like background! Thanks so much for playing Simon Says Stamp Wednesday Create Your Own Background Challenge!